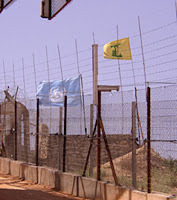 The blue-helmet U.N. troops, who operate under the auspices of the U.N. Interim Force in Lebanon (UNIFIL), are meant disarm Hezbollah in southern Lebanon and be an impartial buffer along the country’s border with Israel. Israel’s ambassador to the United Nations, Dan Gillerman, said he was “shocked and horrified” by the photograph and that it was time for the saluting soldiers to go. “I think they should be recalled and be sent back to whichever country they came from,” said Gillerman. “I think they’ve definitely compromised their impartiality and have in a very big way, in a very serious way, compromised the integrity of the United Nations.” But a UNIFIL spokeswoman said the salute was nothing out of the ordinary.